When one of Unity Publishing’s readers tried to confront a parish where messages from “Anne, the Lay Apostle” were being presented in the homilies, she was treated with great hostility. She tried to show him the recently posted article, Anne, the Lay Apostle is Kathryn Ann Clarke” but instead of reading it, he attacked her with, “You are dealing with the devil. That man is the devil”. By devil, he means me, Richard Salbato. He then handed her a printed out web page from Marian Times, a Medjugorje web site, as seen below. I always felt Paul Baylis’ article was self-evident and paid no attention to it, but since it seems to influence at least one priest, I decided to see what others thought of it and mailed it out. Below are their comments. I have spent a good deal of time talking to atheists and just trying to get them to believe "in God". So, from a purely personal perspective, I am very disappointed with some corners of the so-called Christian media who make this task even more difficult than it was. God is not a God of division. Jesus came to unify mankind in the love of God. Medjugorje, to me, is all about UNITY of religious thought and practice, of keeping it simple, of loving God without man-made restraint. But, it's not my personal issues with Unity Publishing (and others like them) that really matter. Unity Publishing, in the vein of many other quarters thriving on a diet of disinformation from all around the world (and we know who is the cause of that!) have made up their minds that Medjugorje is false and they want the world to know what they think the Vatican should have found out and acted on by now, if not long ago. In their apparent quest for the eyeballs of the sensation-seekers, and casting themselves in the light of maverick crime-busters, they are doing immense damage, splitting the Catholic Church and contributing to a potential fulfillment the end-times prophecy of "brother against brother". This, more than anything, Satan wishes to accomplish. God might be able to forgive millions of people being duped, at His allowance, by the enemy (just as Job received God's mercy for not knowing that he was the meat in the sandwich of God's testing), but I'm not so sure God would smile so brightly on any individual bold enough to negligently afflict the Church founded through the blood and suffering of His only begotten Son. Thus, I say that these people are more dangerous than any false apparition. I came upon some Medjugorje-related book reviews on different websites which repeated the same warning against Medjugorje and invited people to go to Unity Publishing and "read as many articles as possible" to avoid being deceived. This is very similar to the line I read on Unity Publishing's main Medjugorje page, which is a litany of detraction at its worst. I conclude that Rick has been busy setting forth his maggots of detraction and division into the very living rooms of people who are open to conversion - not conversion to Medjugorje per se, but conversion to the Lord. Most of these "reviews" pertained to Sister Emmanuel's "Medjugorje - the 90's", which gives evidence for Sister Lucia of Fatima and Pope John Paul II supporting Medjugorje. The review states: "The quotes in favor of Medjugorje, attributed to the pope and Sister Lucia of Fatima, could not be proved and are most likely lies". Run this line in Google and see how many times the same review has been placed! Nobody makes such a comment unless their sole intention is to defend a negative position on Medjugorje. A normal person with an open mind says "Hmmm, if Sister Lucia really said that about Medjugorje, then....". Rick's writing on Medjugorje is full of this fanatical defensiveness of a position that is scarcely defendable. The weight of evidence against his position is likened to a mountain against a molehill. But, Rick squirms and wriggles and refuses to give. Now, that's scarey! His mission statement is the promotion of unity and a pledge to "dispel the darkness", "break the spells" and free us all from "baffling deceptions" when in reality it is really people like himself who have created the darkness and the spells. He has jumped on the bandwagon of people who created the bafflement where there was none before. He says his articles are "thoroughly researched", whereas it appears more evident that Rick has simply trawled through Google for any detraction article he can find and, without vetting them for complete accuracy, has simply added the information to his own articles or tacked them one after the other in a long list of anti-Medjugorje articles which he has labelled "humble testimonies", encouraging those who are "genuinely interested in discerning the truth about this issue" to "take the time to scan as many of the links as possible". Let us analyse an article by Rick Salbato of Unity Publishing. Rick once wrote that he thought God liked what he was doing on his website. I nearly choked on my coffee cake when I read this comment, after reading what he has on his website. I want to give Rick the benefit of the doubt as being sincerely trying to warn the world of potential false apparitions, but after just a short read of the type of journalism he uses and the sheer determination he displays, at any cost, to literally destroy Medjugorje, I simply cannot conscience it. I simply cannot see any good in what he is doing. It is a long, long essay, possibly Rick thought it necessary to be so, because the guts just aren't there and most debaters will know that if the guts aren't there, you have to pad out the content, use tactics such as straw men and tarring with the same brush, and basically dig and dredge and connect dots and all those other juicy spy thriller things. But as you will see he falls well short. But, what is more amazing is that he found the need or the time to do all this. I'm giving up valuable praying time to write this rebuttal. But, I hope I will pray a little better after I'm through. I am compelled to write and write I will! From a reading of Rick's writings, he comes across as very much lacking in experience at putting together an argument. He also seems to be lacking in some basic theology and his penchant for making statements and claims literally off the top of his head is astounding. All this would be absolutely fine EXCEPT for the fact that it is not just reflecting upon himself, but on the whole Catholic Church and his rash comments and conclusions are doing a lot of damage to the hearts and minds of Catholics. It's time to put a stop to this and let cooler heads prevail. The Virgin endorses "Poem of the Man-God"
I think it is a great compliment when Medjugorje web sites, sites that disobey the Medjugorje bishop, attack me for defending the bishop. As for Anne, no matter who discovered who she really is, the facts speak for themselves. I will let some of my supporters and detractors read this email first and then I will give you the information you need but first know that Canon Law requires priests to give homilies on the readings of the Mass and not on apparitions. "...splitting the Catholic Church and contributing to a potential fulfillment the end-times prophecy of "brother against brother." Funny, but I see this split coming from those who don't see these "apparitions" in Medjugorje for what they really are and what they will, eventually and sadly cause, a schism in our Church. For they follow Medjugorje, not Christ and His Church - not something a true apparition of Our Blessed Mother would ever do or cause. I might add that I see this happening sooner rather than later. May Our Lady keep Her children close to Her and Her Son for our world will be rocked and its very base in the not to distant future. Sheesh! This Baylis dude is off his rocker. What part of the word "disobedience" doesn't he understand? One thing is for sure, these people will know the truth when they die. Will it be too late? We don't have to believe in even approved apparitions or messages but don't they know if they believe in blasphemy of false apparitions that they will be called to accountability for it. Some one needs to tell the author of that article to re-read Luke 12:51-53. So you see, you only outlined and clarified what I had already suspected. Any my suspicions were aroused by the loony-tunes that returned from overseas filled with all the external manifestations of now having learned "The Truth," a truth they believed because "God told them so." Medjugorje has created many false prophets and they do not take kindly to anyone challenging them to face the contradictions. Thank you so much for all you have done and continue to do to educate us in this regard about these matters. I think your pride is sadly misplaced. How about the poor Franciscans and visionaries who need far more defense than the Bishop of Mostar, who has made life miserable for everyone in Medjugorje. I pray for the Bishop's soul, but I pray more for yours. Remember the old Arab proverb, "The dogs bark, but the caravan moves on!" You're the caravan, brother not these cultists. The next thing you know they'll be promoting on Necedah and Bayside. I don't make any claims about being nearly as knowledgeable as you are, and William was, about the Church . I was brought up in Catholic schools and spent the better part of my childhood in the Academy of the Sacred Heart in Grand Coteau. One thing that the Jesuits and the Sacred Heart nuns taught me was - even if I did not understand something, if the Church ruled on it , to have faith in our Church. The Church has ruled against Medjugorje. The Church has declared it a false apparition. That is all you need to go on with your work. This is what having faith is all about; believing without knowing all or anything. I have never known of Sr. Lucia lying or living any other life than that which the Blessed Mother said she would live. The children of Medjugorje have lied and none of the "predictions" regarding their lives have come true. Some of the children have not "become priest" as they said they were told they would become, have divorced and if I am not mistaken, not gotten an annulment, and I am sorry to say, that I don't know about the rest of them because I was not interested in their lives of deceit. They may not be blamed for all of this because I feel that at the time, they were caught up in Satan's scheme and they probably believed that they were seeing the Mother. It was not long after that the bishop began to have doubts about the apparitions and the children should have relinquished the pursuit of fame and fortune at that time. Stand tall in your faith, Rick, and know that the Mother is helping you through this. I am proud of you and I keep you in my prayers daily. As William would always, "Go to the Mother." And remember, you have a great advocate in William. Pray to him, too. He supported you so much in your belief and writings. Take care and pray for me. I am interested in what you have to say. I went to your web site and there is a lot more to read. I don't know if it is pertinent, but you your writings are so lengthy that I often feel like you are trying too hard to get your point across. I am no expert in anything except my love of Jesus Christ and His Holy Mother. God Bless and I may have more to say or ask later on. The attached article says: "Medjugorje, to me, is all about UNITY of religious thought and practice, of keeping it simple, of loving God without man-made restraint." That makes absolutely no sense in terms of Catholic teaching and thought. The entire article is an attack on you, Rick, and does not mention that the bishop of Medjugorje has censored the "seers" and their Franciscan promoters. And it does not mention that Catholics do not promote a "unity" that opposes bishops and their directives concerning apparitions and seers. Obedience to the local bishop remains the identifying factor in true mystical experiences. The author's reference to "man-made" restraint seems to be a slam on the bishop which, again, tells us that the author cares little about the nature of the Catholic faith and apostolic succession and the authority of the bishop and therefore, in my mind, nullifies him as a Catholic writer. I sent my email to "Anne's" bishop last week and haven't heard from him at all, whereas the last time I emailed him about six months ago I heard back immediately. Hopefully this means they are giving "Anne" further thought. Thanks for sharing that article with me. The editor of Marian Times is very typical of all the supporters of Medjugorje. They refuse to hear. They will not look at the facts, because if they did, if they were really searching for the truth, they could not help but know that Medjugorje cannot be authentic. Someday, the truth will be known. 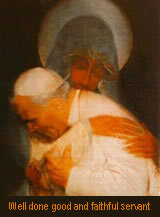 We have to pray for Pope Benedict. I just saw on the news that the Pope recently wrote that he did not agree with Pope John Paul II's hosting of Bob Dylan at a gathering (maybe the youth conference). Pope Benedict said that Dylan is not the right kind of "prophet". So perhaps this Pope will come to our rescue in other matters. I am so hungry for strength and leadership. Rick, I am glad you are able to rejoice when they persecute you. In the meantime, the woman who took my place in Seattle is half Croatian. She was very dubious of Medgugorje. She did not like the fruits she saw of some who came home from there. If you didn't have money, it seemed, you couldn't go. For years, she has wanted to meet her relatives in Croatia. She finally went this past year with her husband and some friends. She was able to locate her family right away, even though their name is very common, like 'Smith'. Anyway, she and her husband decided to visit Medgugorje, total skeptics. Her husband refuses to go to church as there was so much confusion and contradiction for some time. Anyway, when they got to the site, her husband started to cry and she saw some unusual things. She said she was refusing to look for anything. But they did experience a spiritual experience there. I think that is what Church authorities have said. They can't prove apparitions are happening, but admit it is a spiritual experience for many people. Since then, she is still detached but admits something happened to them there that was supernatural. I have another friend who went there and came back not believing in it. I am not really drawn to it. Again, my friend went because of all the talk and that it was somewhat close to her relations. As far as Anne's writings go, it is like poetry. I did not gain anything and could not go on with it. Especially after his rants on YouTube. The man just exudes immaturity. Its obvious you're going to get both barrels (loaded) from staunch supporters of Medju-a-watcha-ma-call-it. I came back to the Church after being away for many many years. But in coming back to the Church I almost became lost again through a profound interest in unapproved apparitions. It is so easy with the help of the internet. I'm glad your website exposes underhanded promoters. I've learned from my mistakes and the mistakes of others. For me, I'm content in my parish Church, receiving Communion, Reconciliation for my sins and all the Holy Sacraments. And knowing Jesus is in the Tabernacle. I know what you're thinking,,, but I try not to leave His Love and Mercy at the exit door of the Church. I take it with me and try to show others. And no Bishop bashing from me. I also believe, as well as my friend in past, that we did sense a strange spirit about it. There is a sensual aspect to it as well. The friend who came back also said she noted how devotees get mad at you if you don't believe in it. A…really told me off as well regarding Medgugorje when she knew she had the upper hand here. My name is Fr. John …….. I too receive Mr. Salbato's e-mails. In regards to your current dilemma you'll find here a web link to the Code of Canon Law on the proper use of the homily during the Mass. I've also included a web link to the authority of the diocesan bishop in regards to apparitionists who sinfully deny this. The one thing that you will find in all true apparitions is total allegiance to the local ordinary. Holy Mary is the dearest, sweetest member of Her Son's Church. She would never infuse disobedience of any sort! In regards to the homily, when an ordained minister gives a homily he is required to preach upon the word of God and the teachings of the Church first and foremost. He can on certain occasions discuss apparitions but he would do well to never promote such things unless they are approved by the Church. However, even in this situation he must use prudence and never come off as if it is truth, or promote a personal agenda. I have talked about Fatima or Lourdes during my homilies but these were usually done on those days where the Feast is celebrated. But even with this a connection to the readings and Gospel should be made nonetheless. This is the primary function of the preacher. Vicar General or even the diocesan bishop if need be. If more Catholic faithful did this for the Church then more pastors of souls may begin to see the gravity of the matter involved in preaching good homilies. You may even aide in saving his ministry and/or soul and the souls of those who are listening to the continued bad teachings. Remember the grace of Courage given to you at Confirmation. It's there for a reason! Even if he has deviated from the truth, a good discussion with him in a friendly, kind manner would do him great benefit. Ordained ministers are after all human, prone to weakness and making mistakes. We are all in this together in the Church, and sometimes the Ordained, like myself, need to be reminded by the faithful of the teachings of the Church. It will do us a world of good and more importantly the Church, too! This guy Paul Baylis, has gone far down the road to Medjugorje and obviously he is not about to go back to the truth. Even his arguments are emotional arguments all designed to justify his emotional investment in Medjugorje. Wasn’t there a saying we spend the rest of our lives arguing to justify our beliefs rather than to find the truth? Weakness # 1: John Paul II did lend some support to Medjugorje (and I have seen a photo of him with the Medjugorje visionaries). Baylis documents its very well, very clever of him. Rick, if you call John Paul II as The Great and think he was a truly wonderful pope, then you have a quandary to whomever you will argue about Medjugorje. No, I am not saying that you should be now a sedevacantist, radical traditionalist, etc etc etc. BE COGNIZANT, that Paul Baylis cleverly traps you – you praise John Paul II as The Great (one of the best popes in History), and John Paul II praises Medjugorje!! That endorsement by John Paul II is enough to mislead lots of people. (Yes, John Paul II should have been more prudent and not done that, like he should have not done Assisi 1986, kiss the Koran and publicly pray to St John the Baptist to PROTECT Islam – therefore I have come to the conclusion that John Paul II is not The Great and not a really good example of a great pope. STILL then, my dear John Paul II has given me a Great Problem – when I argue against Medjugorje, I have to argue now that JPII was in Error). Weakness # 2: You argue against the false ecumenical messages from the Gospa, however, Baylis is very clever – he quotes Nostra Aetate and Vatican II spirit documents, and John Paul II The Great, and they all sound like Gospa!! This for me is proof that the Gospa is an invention by the rebellious priests who write the messages – they spend their time reading post-Vatican II documents. THE FAKE GOSPA MESSAGES ARE JUST VATICAN II IDEAS REPACKAGED – obviously not of a heavenly source. Rick, do you believe what Nostra Aetate says? That Muslims, Christians and Jews all believe in the same one God?? Nostra Aetate, Gospa and John Paul II says so --- why should you contradict their (false) ecumenism?? Well, I have no such problems – Nostra Aetate has errors in it, JPII is in error and Gospa is a fake – the Bible clearly says whomever does not have Christ as the Son, does not have God as their Father. With that logical conclusion, out the door goes Medjugorje (and Nostra Aetate and puts into suspicion many of JPII’s ecumenical efforts). But you have not come to that conclusion. So therefore, you are now in the inevitable position to try to defend illogical contradictions. 1. FATIMA – Sr Lucia’s diabolical disorientation – caused by Vatican II (Nostra Aetate) which in turns infected John Paul II (his mind was possessed by many modernist ideas), which in turn infects and supports Medjugorje. You do not link Fatima to Vatican II / John Paul II, they are part of the disorientation – you go straight from Fatima disorientation to Medjugorje and therefore your reasoning is open to be smashed by the types like Baylis who can use Vatican II and John Paul II against you. 2. Virgin of Unbe in Spain, 1969-1977. I mentioned to you before this apparition, and I believe it is 100% legit, and not condemned by the Bishop, viewed favorably with local clergy participating. The Bishop has not decided yet, because unfortunately, the messages of the Virgin Mary are very hard, like Fatima and Akita. THERE ARE LOTS OF DOCUMENTED MEDICAL MIRACLES including photos. Here is the website again: www.virgendeunbe.org there is a section in English. The Virgin of Unbe (she appears as the Sorrowing Mother in black) said such strong messages, that some messages ARE NOT POSTED ON THE WEBSITE, but rather, I had to read them in a Spanish book done by a Marian author, who said that he actually DELETED THE STRONG MESSAGES from this first editions of the book because he thought it could come from the DEVIL but in the end, he admits they were true!! And frankly speaking, that completely 100% describes John Paul II – he was UNJUST as he did not do what he was supposed to do – he did NOT condemn Medjugorje knowing it was false and divisive, but rather let it go on because he felt that people praying was good and superseded the need for the Truth (which is Christ). John Paul II also appointed many many unorthodox and homosexual bishops and cardinals, even knowingly. His false interreligious dialogue is really an eternal scandal to the Catholic Church and if it was not because of Divine Mercy, John Paul II would have gone on to eternal reprobation (yes, I think that he is saved but not because of HE WAS JUST, NO, but because of Divine Mercy). So, Rick, do you see the clear dilemma?? Either you are for Vatican II, John Paul II, the Gospa and Paul Baylis (which are all in harmony with each other and support each other), or you are for Fatima, Akita, Unbe, and have to argue that Vatican II has errors (Nostra Aetate), is part of the diabolical disorientation, and JPII (PARTIALLY) fell under this disorientation and made IMPRUDENT decisions and papal indiscretions. For me, all that I can say is, it is better NOT to believe than to believe apparitions and private revelations. For we are never required to believe them and we will be more safe if we don't believe them. We don't commit sin if we don't believe them. The Sacred Scriptures and the Traditions of the Church is enough to send us to heaven if we only make good use of them. If we believe in apparitions, there is a chance that we will fall to heresies and errors. If we do not believe them there is nothing that we will lose. For me, as I see it, the problem is that people want to study apparitions rather than the Writings of the Fathers, Doctors and Saints of the Church which are more very important than apparitions. This is a strategy of the devil to draw people away from the true doctrines of the Church. When St. Teresa of Avila was requested by Our Lord in a vision to do something, she consulted learned men first for fear of deception of the devil. Doubt gives us security, it is one way used by Our Lord to protect us from the devil. The Lord sometimes allow the devil to give revelations to test us. I give you bro. Rick the permission to pass this e-mail to others. Just my response to this man's article, the early messages speak for themselves. I contacted a "medjugorje" web site that had SUDDENLY removed all messages of the first few years. YOU didn't convince me there was a problem with the authenticity of Medjugorje, the early messages did. I wrote the web site and asked, where are the messages from the first few years and he said "The people in charge of the apparitions asked me to remove them" - and this is really key - "because they hadn't had a chance to review and approve them before they were distributed." If that doesn't sound like the Hand of Man behind these "apparitions" I don't know what does. So the whole first few years we can't trust? What are we saying here? Either they were ALL of God or NONE were. You can't have some messages from God and some not. You don't have to be a brain scientist to see that this is a fraud and if it helps people, that's nice, but the number of supporters has never been a reliable argument for authenticity. Those early messages were SCARY and did NOT help people or the church or God's mission. I try to convert atheists all the time and Medjugorje would scare them away faster than almost anything I can think of. I think it hurts the cause. Thanks for blind coping (bcc:) me with this. I am first most happy to see that someone is reacting. This Medjugorje matter is not some vague issue that has an ambiguous answer or lacks a response from the Church. It has a direct and unequivocal creditability ruling from the appropriate ecclesiastical authority, the local Bishop. Mr. Baylis seems to be making up his facts from the beginning. He makes the charge that that the unitypublishing.com web site is a source of disinformation. Anyone who has been to this web site knows that the sources for almost everything on it are quoted in a bibliographic style. This lame excuse for a so-called impartial plea for "unity" is obviously based on acceptance of Medjugorje and is transparent for what it is... a personal and emotionally charged attack. Where are the sources for this op-ed piece? He quotes the web site and then answers not with facts but with his own unqualified derisions. I guess what really is the most irritating and insulting to the reader about the article is how the author tries to assume the intellectually superior high ground by trying and failing to sound like a lawyer and portraying you as some sort of venal Cotton Mather. IF he is a lawyer, I wonder how many cases he has won with his clever blow-by-blow illiterations along with the "straw-men" and leaving his facts outside of the court room. The ending paragraph of "...More Dangerous..." does a very good job of revealing it's true purpose. Rick is causing Catholics to think and making them reconsider their positions on Medjugorje.... how awful! Mr. Baylis's version of Catholicism is one to which I will not subscribe. It is one that ignores the Church and follows its own agenda. "If you want to invent your own religion, do not be a Catholic. If you want to teach the Church rather than let the Church teach you, there are plenty of other churches for you, churches that welcome theologies without miracles, moralities without absolutes, and liturgies without adoration. Please do not be a Catholic unless you believe the Church's claim to speak in these areas in the name of Jesus Christ." "There is no such thing as a 'cafeteria Catholic'. Catholics do not pick and choose among the Church's doctrines and laws; we receive them gratefully from God, we 'eat all the food Mother puts on our plate'". "A 'cafeteria Catholic' or a half Catholic or a 95 percent Catholic is a contradiction in terms. If the Catholic Church does not have the divine authority and infallibility she claims, then she is not half right or 95 percent right, but the most arrogant and blasphemous of all churches...It must be either/or, as with Christ Himself...The only honest reason to be a Christian is because you believe Christ's claim to be God incarnate. The only honest reason to be a Catholic is because you believe the Church's claim to be the divinely authorized Body of this Christ." Rick Salbato is a honourable and honest person. I know him personally since 2000. He is researching and looking for the truth. You seem to be defending yourself. Can you explain me why the Gospa is not speaking about the desobedience of the local franciscans and always defend them in their conflict against bishop and pope? Did you ever speak with bishop Peric? I did, for 3 hours. I have 200 arguments against the authenticity of Med. after my 24 visits there. Before I have been giving a 100 conferences in favour of Med. Now you can write about me, without knowing me, like you did with Rick. No problem because the Lord knows the truth about everybody. I was amazed by the contents of Baylis’ article. He writes and I quote: ”The weight of evidence against his position is likened to a mountain against a molehill. But, Rick squirms and wriggles and refuses to give. Now, that's scary!” What really is SCARY is the fanatical defense of the Medjugorje event and other hoaxes that have been investigated (supposed “apparitions”, “divine writings” and “seers”) and the results have been very clear there was (were) no apparition(s). People with that kind of fanatical attitude and open disobedience to the Bishop are really SCARY. Concerning the article blasting you in "Marian Times", keep to your policy of "not giving in" to what the Medjugorje pushers want. I myself am often confused concerning the subject, but am leaning heavily towards false, because of the local Bishops ruling, and because the fruits of the seers are not good. This has all come from you, and with proper documentation of the official papers, so how does one refute that? I consider it a mess, and stick to the approved Fatima and Akita, for we are not required to believe them for our salvation. If Medjugorje is of the devil, he really is getting good. To think of all the people led astray if it is demonic, is overwhelmingly sad, and God Bless you for trying to warn us. I do read the messages, just to see what is said, which I feel is so generic. I agree with you, Our Lady is not a babbler, and this is what turns me off the most. As for this guys article, all I see is him personally attacking you...but gives no proof to discount what he states are your "errors". It is all about discrediting you for your non-acceptance, but not a defense of why it should be accepted in the first place! Are the links at the bottom direct links to your articles? I clicked on them but it was taking so darn long...could be my connection today. If so, hopefully readers of his column will read what you have to say. If they have "eyes to see and ears to hear", then it will be a blessing! I was forwarded a copy of your email to Rick Salbato about your concerns with false things going on in the Catholic Church. Have no fear, these things will occur until the second coming. Jesus chose Judas as one of his disciples for the purpose to warn us that there will be scandals in the Church until the end of time. The smoke of Satan is within the Catholic Church, let there be no doubt about that. I know nothing about this Anne you refer to but I do know a little about Medjugorje. My late Bishop Paul O'Byrne permitted Vicka Ivankovic to speak at my parish years ago and I have a friend who visited Medjugorje 3 times. I never needed to believe in these so- called apparitions in order to affirm my faith. I believe in the teachings of the Holy Catholic Church and am in full communion with our Holy Father Pope Benedict XVI. I never felt a need to go to Medjugorje to check it out. I have a brother who is studying to become a priest who went there and claims to have witnessed a miracle of the sun while there. I am completely convinced that Medjugorje is a complete fraud! In my research I found unitypublishings.com website and www.catholicdoors.com website that refuted the Medjugorje claims, but the one that helped me to see the truth of Medjugorje and taught me how to discern the truth about any apparition is the book written by Michael Davies This is his website. www.mdaviesonmedj.com and you can download a copy of his book. I highly recommend reading it! The key to discerning the truth regarding apparitions and the like has got to do with the virtue of obedience. St Faustina of the Divine Mercy said that Satan cannot hide himself in the cloak of obedience. It is easy to see how the false seers of Medjugorje and the priests who support them have failed in regards to this essential virtue (read the book). Also remember the lives of saints like St. John of the Cross, St. Joseph of Copertino, St Pio of Petrelcina, St Faustina and how they excelled at this virtue. Satan can hide himself in the cloak of humility so when you see the seers and their followers indulging in pious external practices of praying the rosary be not deceived. Ask yourself how many true saints in the church wished to be exposed to the public attention? I cannot name any. Why have there been no Medjugorje seers giving themselves to Jesus in a Holy religious vocation? They all should have devoted their lives to a religious vocation, think about it, what would you do if our Blessed Mother Mary appeared to you? I pray for the seers of Medjugorje that they will repent of their deceptions. I pray their supporters and followers will see the light of truth and return to true authentic faith based on the Catechism of the Catholic Church in full communion with the Pope. My advice to all Catholics to avoid being led astray is to know and follow the Catechism of the Catholic Church, remember the promise of Jesus that he would build his church upon the rock (Peter the first Pope and his legitimate successors) and that the gates of hell will not prevail against it. Do not be afraid when scandals occur in the church since Jesus chose Judas knowing full well he would betray him and there will be others following the example of Judas until the second coming. Prayer and the sacraments are all we need to combat these errors. Remember that we are not compelled to believe and follow any private revelations (catechism #67) even the authentic ones. I have been researching various religious phenomenon as well as non religious phenomenon such as the 9/11 myth, global warming, the Israeli/Palestinian middle east conflict and others. In my research I have also studied a bit about propaganda techniques, the use of fear mongering and truth suppression and misinformation to manipulate people. It is truly amazing the degree of deception and manipulation we are exposed to in all aspects of our lives in this world. I will pray for the intentions of yourself, your parish, Bishop and clergy. Please do the same for me. Ours is a spiritual battle. Be not afraid! I highly recommend Holy Hours of Adoration to help in the battle and of course the Holy Rosary a favorite weapon of St. Padre Pio (he prayed 17 rosaries each day!). Looks like you have hit the big time Rick! "Unity Publishing, in the vein of many other quarters thriving on a diet of disinformation from all around the world (and we know who is the cause of that!)" With this statement the author demonizes you and your ministry. And what are the "many other quarters?" Your site is absolutely unique. I have looked at hundreds of sites on Catholicism and no site comes close to yours in terms of the sheer volume of documentation and teaching against false apparitions. "I'm not so sure God would smile so brightly on any individual bold enough to negligently afflict the Church founded through the blood and suffering of His only begotten Son. Thus, I say that these people are more dangerous than any false apparition." With this statement the author is showing that he is not interested in the truth. He would prefer to go on demonizing you than dialogue with you. "I came upon some Medjugorje-related book reviews on different websites which repeated the same warning against Medjugorje and invited people to go to Unity Publishing and "read as many articles as possible" to avoid being deceived." This is the reason why he is writing and taking your site seriously. He is afraid of what you write. "But, Rick squirms and wriggles and refuses to give. Now, that's scary!" "His mission statement is the promotion of unity and a pledge to "dispel the darkness", "break the spells" and free us all from "baffling deceptions" when in reality it is really people like himself who have created the darkness and the spells." "I simply cannot see any good in what he is doing." You need my prayers Rick. This sort of thing is dangerous. It is even more dangerous that the author is not interested in dialogue or in the truth, but prefers to see you as the cause of any trouble he might be having. I will have a look at the rest of the article when I get more time. Meanwhile, keep at it! I will keep checking your site to see your rebuttal. I wonder if this guy really read any of your articles. You have saved me much grief in my own search for truth, I read much, especially works by the saints. I find that your research very true - True to the Faith and to God. This guy says that your squirm and wriggle. It seems to me that he's the one that is doing the squirming. Keep up the good work my friend, we'll probably never meet in this lifetime, but you're one of the ones I can't wait to meet in Heaven, along with King David and Saint Peter. Thanks for your article. The Medjugorje adherents must be very angry to find your good arguments against their own weak ones for all and everyone to read on internet. They will stay blind though. be a good opportunity. I myself do not expect that, since he is such an enthusiastic charismatic. Medjugorje or Amsterdam, the Vatican does not dare to stop it. Rome's solution is compromise. The Foundation of the Lady of all Nations in Amsterdam claims on Internet, that the CDF has done some slightly changes of the prayer of the Lady and acknowledged it there after. I am sure it is the other way around and that it was bishop Punt who changed the words and got the CDF to approve the changed prayer. Imagine, now the Lady of Amsterdam is the "blessed Virgin Mary"!! Strange is only, that the CDF does not give any formal or official information or explanation about their so-called own involvement in this amazing development. We and others have written to Rome without getting any reaction. We then wrote to bishop Punt of Haarlem/Amsterdam. He tried to escape a proper answer. He wrote us, that "the foundation of the Lady of all Nations is ecclesiastically approved and therefore we can be sure that what the foundation writes, is true". That's all. He avoids to mention the CDf or himself. It's fishy. As a result, our side can now claim, that Rome does not acknowledge the case, because Rome fiddled with the prayer of the apparition. The other side can claim and does so, that Rome by having slightly changed the prayer of the apparition and having acknowledged it, it has also accepted the whole apparition. This way Rome keeps everyone 'happy', so-called. told us, that it is important that people write, never mind if they do not answer, as long as they get the massage that people are concerned. I would accept it as a compliment too! This is precisely what is so dangerous about, yes, FALSE apparitions. One depends on them rather than the Faith. One is made to feel part of the apparitions, a defender, so as to "feel" that they are defending "God's Mother." All else is secondary. One is not thinking about the content of the messages, one just "feels" they are right and since a person has already committed himself or herself to them, then they must be defended with rigor for if they are proven false, then one's whole faith drops away because they have substituted a false apparition to Christ's Church and the Truth. The apparition becomes preeminent. I know because I was involved in a false apparition about 25 years ago. Their is a pyschology to apparitions, and to those people who start false ones, they know how to manipulate people into their way of thinking! And I believe they are spurred on by the devil if they were not already inspired by him. We can't leave out the money end either. Rick, as you well know, every response to your articles on Med. in this articles are easily refutable. Facts are facts. You also know you are dealing with emotional people here who do not see the true beauty of our Catholic Faith because this appartions supercedes anything the Church does. I'm willing to bet that many on the Med. side would even detract the Holy Father if he came out with negative statements. I do wish the Church would have acted more quickly on these apparitions for the sake of people's souls. Nowadays, if you stand for the Truth, you are a hate monger. What ever happened to the honor and glory of God? I also believe, from my own experience, that some people are literally afraid of going against the appartions because they think they are going against the Mother of God! That they don't have a right to question the apparitions because they think they will be castigated. That fear of human respect haunts them. I wonder how they would respond to Donal Foley's book on Medjugorje? He's referenced it to the hilt, which is always a good thing to do. What axe did he have to grind? None, except a love of the Truth. People hate to look at the truth because they are too comfortable in the shoes they are wearing. That's why the attack on you. You are affecting their comfort zone. On a side note, that's part of the reason why there is so little concentration on the Sacrament of Penance today and the lines are shortening. People are afraid to examine their conscience today for fear of discovering what we are, sinners. As Archbishop Sheen said once, "It used to be that only Catholics believed in the Immaculate Conception. Now everybody believes they are immaculately conceived." You and Donal's book have said it all. I just wanted to throw something in on the pyschological end of the spectrum. Rather than study the beauty of our faith, people would rather jump in on the sensational. Instead of reading history and the spirituality of the Saints, now we can be our own saints and feel part of the clique that the "Gospa" is speaking too. How many disillusioned Catholics are we going to have when the pronouncement comes against the apparitions? How many will fall from the Faith? The devil is willing to lose a few in order to gain many, and lose many in order to gain a few souls. In this day of the visual, he knows he has to present the fantastic to sucker people in. Do things that make them say, "Wow." He knows the Church will be victorious in the end, and his time is short. He's got people believing the apparition is right and the Church is wrong. He's knows the Church is in a weakened state, so he attacks. When the Church is holy, the attack is always from the outside. When the Church is not so holy (not talking about the marks of the Church here) the attack always comes from within. These people fail to see that it is Med. that is causing the division, not the people who speak against it, who have a right to speak against. The message is causing division precisely because the messages are false. Mix some truth with lies and keep telling the lies long enough and you can get a multitude to follow you. I think everyone is afraid to ask the children seeing the "gospa" the hard questions. If you challenge them, people think they are martyrs for the suffering you are causing them. It's a hard situation to deal with. I think we just have to continue to tell the truth in season and out of season. I have rambled on long enough. God bless you Rick. Keep up the fight. I am doing it on a local level here. People look at me like I am the devil himself when I point out some things. Thanks for having the backbone to say the Truth. Take care. It is unfortunate that people are so adamant about distorting the truth. I have found Unity Publishing nothing but helpful and am quite impressed that you qualify your own opinion so well. Facts are facts. Medjugori is bad news and the Church has most certainly condemned it. Those who think otherwise are just plain wrong. There may come a day soon when our holy father must step in and correct all those who continue to spread the lies. My wife and I pray for you and those like you every day.. Please keep up the great work in spreading the truth. Don’t worry, that this guy is forgetting that the division is not caused by us, but by the apparition itself. Why? Because if there was no apparition, there would not be a division. For if the apparition were really supernatural from God, there would be no divisions among the faithful of the Catholic Church, or She would simple not appear if She would had known that there would be divisions. I sense anxiety and possible impatience in Paul’s letter. He is certainly hurting. Poor soul, I hope that he can make it through this trial. May God give you and your family courage and continue holding onto Truth in our Catholic Church. May God give us all strength to help those who need some strengthening during these times of real trials. I will appreciate if you keep me posted with this issue.